Luxury Swiss watch manufacturer, Ulysse Nardin, lent its support to the prestigious 2015 Yachting premiere, in collaboration with its long-standing partners in the country, W. Salamoon & Sons. 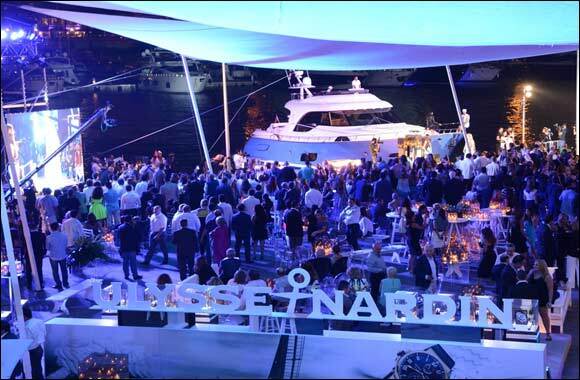 Strengthening its seafaring legacy, the tie up saw Ulysse Nardin serve as official timekeeper of the event, the premiere of which takes place between the 8th and 9th of June at the Zaitunay Bay in Beirut. On the occasion, Ulysse Nardin also showcased some of its sparkling novelties such as the Jade, Royal Ruby Tourbillon, The Ulysse Nardin Hourstriker Oil Pump, the Black Sea Marine Perpetual Ltd Edition and the Marine Diver “Boutique Edition. Being touted as something that has never been witnessed before, the 2015 Yachting Premiere brought together a diversity of luxury players in a show that had Government officials and other important dignitaries from the Arab world in attendance. Giant screens and loudspeakers were deployed to announce and depict the features of the opulent yachts that participated in the exclusive yacht parade. Adding a further touch of elegance to the luxury parade was a special trunk show by world-renowned designer, Elie Saab, whose stunning designs were seen on models during the event.